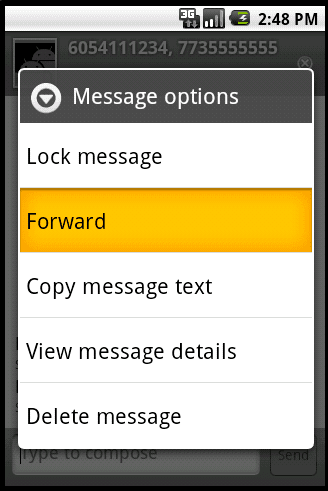 Forward a text message from your Android device to another person with these steps. Note: These instructions are intended for the stock Android 5 Messaging app. Your carrier may provide you with a different messaging solution. Open the message thread that contains the individual message you would like to forward. While in the list of messages, tap and hold the message you wish to forward until a menu will appear at the top of the screen. Tap other messages you wish to forward along with this message. They should show as checked when selected. Finish your message up by adding your own message if desired. Tap “Send” when ready. Why don’t I have this option on my device? Be sure you are tapping and holding a single message. Not an entire thread. There are a few wireless carriers that disallow this option. In these cases, it is recommended you download and use Handcent or ChompSMS for sending and receiving text messages. I get to the forward arrow but I need to be able to select who I am forwarding this message to. I need to forward an entire text convo from my husbands phone to mine. He has a galaxy sport and I have an LG note 3. I get the option to forward one text at a time, however, I need to do the whole thread. The Android directions above don’t work. HELP!!! Works ok up to the select forward – doesn;’t mention you can only forward to existing contacts – which is the problem. Neither Handcent nor ChompSMS (not Samsung’s built-in SMS app) gives me the option to forward – just things like Add to contacts, delete, mark as unread, etc. I need to find out if the Samsung Galaxy Grand Prime from t-mobile can forward an entire text conversation at one time. So far I cannot find this option on the phone or in the manual. Can it be done? I need to know how to forward an entire message thread from my Android to someone else that accidentally deleted them. Please help me I’m desperate! 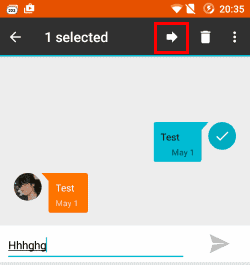 how to I have my friends all texts forwarded to my phone? How do you forward an email on the Moto z force? You can also try this Android app “Manage My SMS” . This can forward your SMS to the preferred eMail Id and also send information on missed calls through mail incase you forget to carry your phone with many more features. This option is there only for few messages. Others don’t get the option to forward. Don’t understand why? coulds you please help? Thanks Mitch, this was very easy to understand and follow.